We live in a digital era now, an era where everything is connected and where technology drives the population. This is an era where Internet is no longer just about sending an email or compiling information. Internet now controls everything, from controlling electrical plants to tracking online purchases to literally everything you can possibly think of. With the rise of all this cyber stuff, cyber security has become a more pressing concern than ever. People are so consumed by this so-called social media addiction, this gives rise to a myriad of security issues. For all the hope and promise of the digital age, ours is also a time of cyber anxiety. Computer viruses are the single greatest security threat concerning both personal and organizational security. Fears over computer viruses increasingly compromise our notions of privacy and security and have allowed antivirus programs to become more common at both work and home and at the government level. There are four key threats to the electronic system – spam, bugs, malware, and denials of service – all of which can endanger your computers. This is why we have antivirus programs installed in our computers to protect our computers from all kinds of malicious threats coming from both trusted and untrusted sources. Antivirus software is a special security program aims to give better protection than that offered by the underlying operating system. Norton is one of the most recognized names in the computer security industry. Windows Defender is the Microsoft’s very own anti-malware program that comes pre-built in the Windows operating system. Norton is one of the most recognized names in the computer security business and the most widely used all-around powerful security program developed and distributed by Symantec Corporation. Symantec is a California-based cyber security company that provides complete security solutions to small, medium and large enterprises from emerging threats. Norton Antivirus software ranks among the top antivirus software programs for its effective virus detection and blocking abilities. Norton, like many antivirus companies, perform regular source code security audits and apply safe programming practices to reduce the odds of having exploitable file format bugs. Norton not only protects your system from all kinds of computer viruses, it also performs periodic scan of your system for other weak spots such as outdated software, plus it also protects your login credentials with the help of a password manager. Windows Defender is the Microsoft’s very antivirus and anti-malware program that comes pre-built with Windows 10 operating system to help protect your system from malware, viruses, spyware, and other cyber threats. Historically, Windows Defender has come in-built with Windows 7, Windows 8, and Windows 8.1, but later evolved into a full-fledge antivirus program in the later versions including Windows 10. It replaced Microsoft Security Essentials but uses the same virus definitions and anti-malware engine. It offers real-time protection against malware so that malware gets blocked when it tries to sneak into the operating system and it also notifies you every time an application tries to change any setting in the operating system. – Norton is an all-around powerful security program developed and distributed by Symantec Corporation – a California-based cyber security company that provides complete security solutions to small, medium and large enterprises from emerging threats. Norton Antivirus software ranks among the top antivirus software programs for its effective virus detection and blocking abilities. Windows Defender is the Microsoft’s very antivirus and anti-malware program that comes pre-built with Windows 10 operating system to help protect your system from malware, viruses, spyware, and other cyber threats. – Security is one of the key points to consider when choosing the right antivirus program for your system. Norton is known for its effective virus detection and blocking abilities when it comes to protection. It comes with advanced virus removal and protection technologies which are always up-to-date to protect your system against all kinds of threats including spyware, malware, ransomware, and unsecured websites. 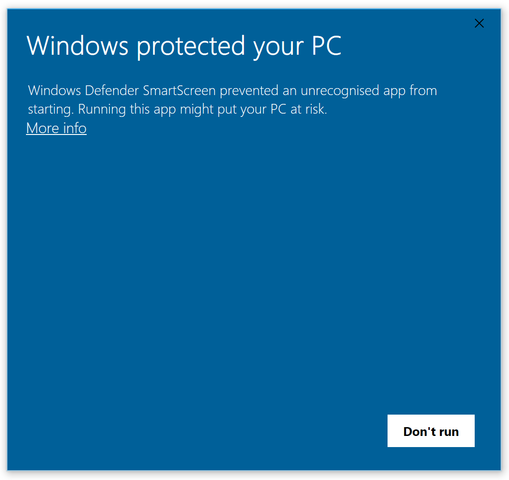 Windows Defender offers real-time protection against malware so that malware gets blocked when it tries to sneak into the operating system and it also notifies you every time an application tries to change any setting in the operating system. – Although Norton is as good as any other antivirus software and it’s a lightweight security program with a little effect on the performance of your system, it requires number of services and running processes that constantly run on the background, eventually consuming a lot of your system resources which result in high CPU usage. Windows Defender, on the other hand, comes in-built with Windows 10 operating system and offers real-time protection against malware, resulting in extremely high CPU usage compared to most antivirus programs. However, the CPU usage usually escalates when Windows Defender scans the system for threats. – Norton’s suite of antivirus software and utilities cost relatively higher than most of the other antivirus programs on the market. Norton Antivirus Basic starts as low as $50 for a year and the Norton Security Standard starts from $70 a year and goes all the way up to $110 a year for the Norton’s most expensive program, Norton Security Premium. Windows Defender, on the other hand, comes in-built with Windows operating system absolutely free of cost, which means if you’re running Windows on your computer, then Windows Defender comes pre-built with no additional cost. Norton is one of the most recognized names in the computer security industry, whereas Windows Defender is the Microsoft’s very own anti-malware program that comes pre-built in the Windows operating system. Windows Defender provides the same level of protection and uses the same virus definitions and anti-malware engine as Microsoft Security Essentials, providing all-around protection against advanced security threats such as bootkits and rootkits. Norton is already a popular name in the security business and has been around for a while and is constantly working towards compute security. Sagar Khillar. "Difference Between Norton and Windows Defender." DifferenceBetween.net. 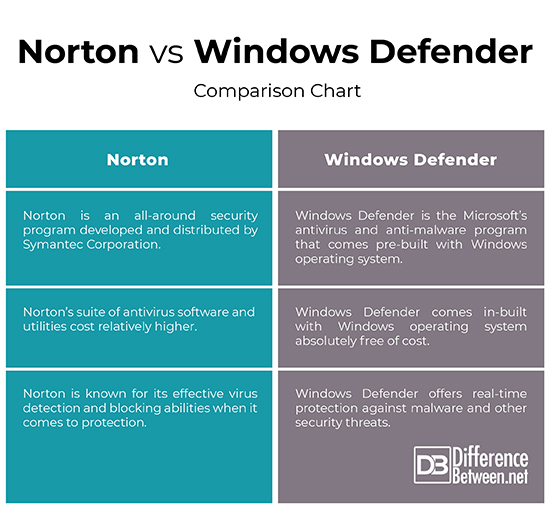 April 4, 2019 < http://www.differencebetween.net/technology/difference-between-norton-and-windows-defender/ >.